When it comes pre-purchasing a game, it’s usually not that big of a choice. When it comes to AAA titles, you do get a lot of options on how you want to purchase your game. Let’s go through the different options for Destiny and what they specifically include and what value they present. All prices are MSRP. All editions are for every console, except for the editions that come… with a console and the Digital Guardian Edition. This is just the regular, run of the mill copy of the game. It’s in a little dvd case and you pick it up and play it. It’s also available as a digital code for the PS3 and the PS4, if you don’t want to bother with going to the store. Which is what you should do if you own a Playstation because the codes are mailed out day one, hour one, minute one, second one. Well, that’s how they’re supposed to come, no guarantees and all that, but it’ll get you in the game faster. A steelcase case with the game. This is the edition you want to purchase if you’re serious at all about the game and don’t care about the expansion pass probably going on sale at some point or at all, because realistically $59.99 plus $34.99 is $94.99 and you’re pretty much getting the game, plus the expansions, plus for $5 you get tons of loot. If you’re going to buy the game and if you’re excited to play it beyond the first time you boot it up, this is definitely the way to go, unless you own a Playstation because. 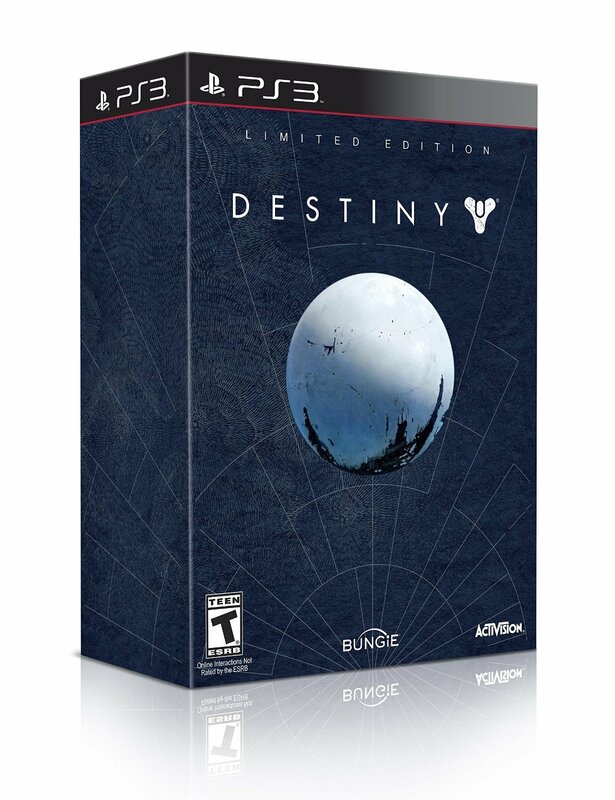 This contains all of the digital aspects of the limited edition without the physical. If you don’t want to the physical stuff because you know it’s going to junk up your place or whatever reason and want to just own the game and the cool digital stuff that comes with it, also to get a discount on the expansion pass. 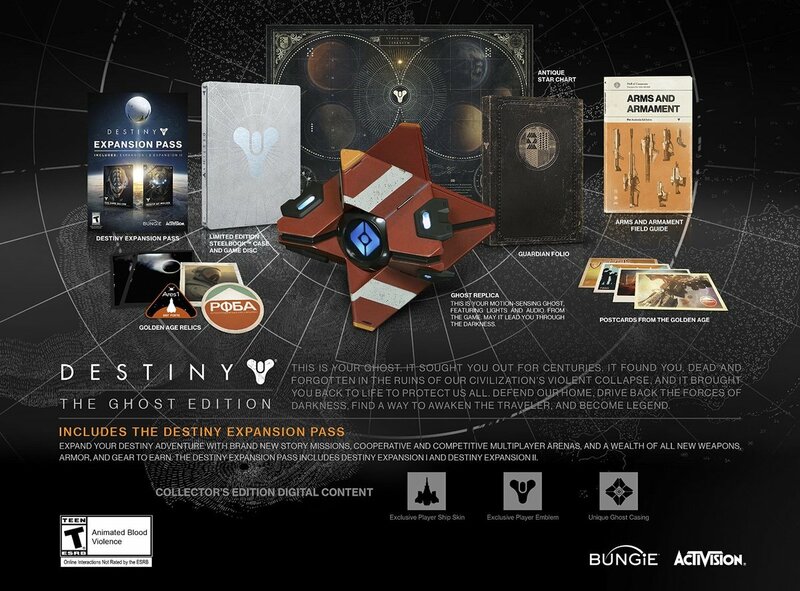 This edition, which comes available in September, contains all of the items from the Limited Edition, but it also has a snazzy case and a replica ghost that is apparently motion sensing and lights up. Which is cool! This is a novelty box, only if you want the ghost thing and don’t want to see if they become insanely cheap on eBay or not. If you don’t own a PS4, then there is like no reason NOT to buy this edition. Let me outline why, you get the game, the console, 30 days of Playstation Plus, $10 store voucher, and that’s about it. It’s a great value if you want the base game and a really cool looking PS4 for less than a regular PS4 plus the game, at launch, plus the white PS4 looks awesome. Well that’s the various ways to buy Destiny! Good look out there future guardians.